The event celebrated 18 rising high school juniors who completed Facebook’s six-week internship program . Facebook interns and their families gathered at the social media company’s Menlo Park headquarters for the “Facebook Academy” graduation on Wednesday. The event celebrated 18 rising high school juniors who completed Facebook’s six-week internship program offered to underprivileged students. Facebook's "dismal" record on diversity has been widely reported. The company itself knows its employees are mostly white. Its own statistics show that more than 55 percent of its workforce are white and that the company has more "work to do" in terms of building a more diverse workplace. But the issue of changing that is "central" to Facebook, Maxine Williams, global director of diversity said in 2015, as she noted the many efforts the company has taken to reach out to young people of varied, underrepresented backgrounds to teach them about tech. One of those efforts is the summer academy, where eligible students come from the predominantly lower income areas of East Palo Alto and Belle Haven, and from Redwood City. They can also apply if they attend Mission High School or John O'Connel High School in San Francisco. Agustin Torres, the junior Community Engagement Manager for Facebook, as well as the head of the Facebook Academy program, hosted the graduation. He described his pride at seeing all the students’ success. The students in the Facebook Academy program were placed into different departments within the company, including transportation, facilities, information security and communications. Each group came on stage to present what they had been working on for the past weeks, as well as their biggest takeaways from the internship. Bianca Valencia, a student at East Palo Alto Phoenix Academy, said that she would have never explored a career in technology before she started interning at Facebook. Now, Valencia said, she’s open to pursuing it in the future. Valencia was a part of the finance department at Facebook, and she spoke to the audience about her project of working with 460 vendors that served underprivileged communities in the area. She hopes to attend Columbia University. Four students displayed a demo of an app they had created during their time at the company called “XPress Shopping.” The app essentially aims to cut down on long lines at the grocery store by providing an application that can scan barcodes and accept payment for purchased items. Alex Caceres, one of the students who worked on the app and was part of the Information Technology department during his internship, got emotional on stage as he described the lifelong friendships he formed. 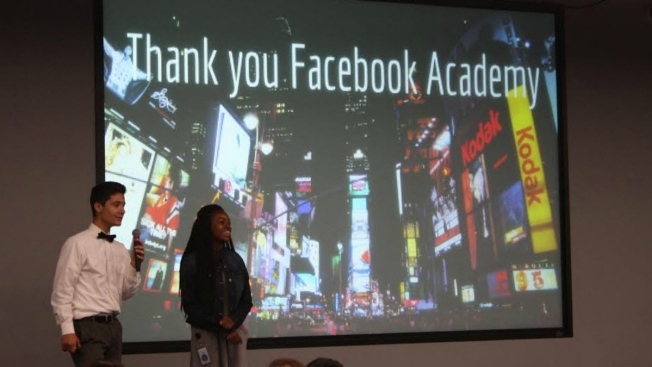 The Facebook Academy has taught nearly 100 students since its inception in 2012.